Forum Index > Off-topic Talk > How did they do this unusual leather grip wrap? Posted: Mon 10 Nov, 2008 1:52 pm Post subject: How did they do this unusual leather grip wrap? Firstly, hi, I just registered! I searched a bit on this site for this answer first, but didn't see any examples of this particular type of wrapping. Does anybody know what this is called, or how it's done? (Just the leather part, obviously.) It looks, like many such things, familiar and relatively straightforward, yet I can't figure out for the life of me how it's done. Posted: Mon 10 Nov, 2008 2:07 pm Post subject: Re: How did they do this unusual leather grip wrap? Just guessing, but two strips wound in opposite directions at the same time, one always taking precedence at each turn (when I wrap the belts around my scabbard for storage the effect is (broadly) similar in appearance). Hello Eric, and welcome to myArmoury! This might not be an easy question to answer as this is a nonfunctional fantasy object. Therefore, the wrap is not bound by the requirements and restrictions of functionality; so anything goes, and the wrap does not have to correlate with any standard wrapping methods that our membership might recognize. Remember that this site is a "Resource for Historic Arms and Armour Collectors." Of course, that doesn't mean that we cannot speculate. But without seeing and inspecting the item in person, I doubt that we could definitively choose between any of a number of possible configurations that would yield this appearance. Play WoW much? It is a nice rendition of the Lich king sword isn't it? As for most here telling you exactly how it's done I'd have to agree with Gabriel. The focus here is on function and as pretty and near to my heart as WoW is, the weapons simply aren't plausible. From my experience with movie replica wall hangers like this one I'd say it's just glued alternating strips of a leather like substance with no thought to the stress placed on the wrap during a swing. The glue seams are most likely covered by the metal rings, which probably hold it all together. It may look pretty but please don't get in the habit of swinging her, ever. Play WoW much? It is a nice rendition of the Lich king sword isn't it? I know I've spent too much time playing World of Warcraft when I recognize that replica right away. Pity it would probably fall to pieces if you actually ended up swinging it. I'm also wearing a WoW t-shirt at work, for the geek factor. 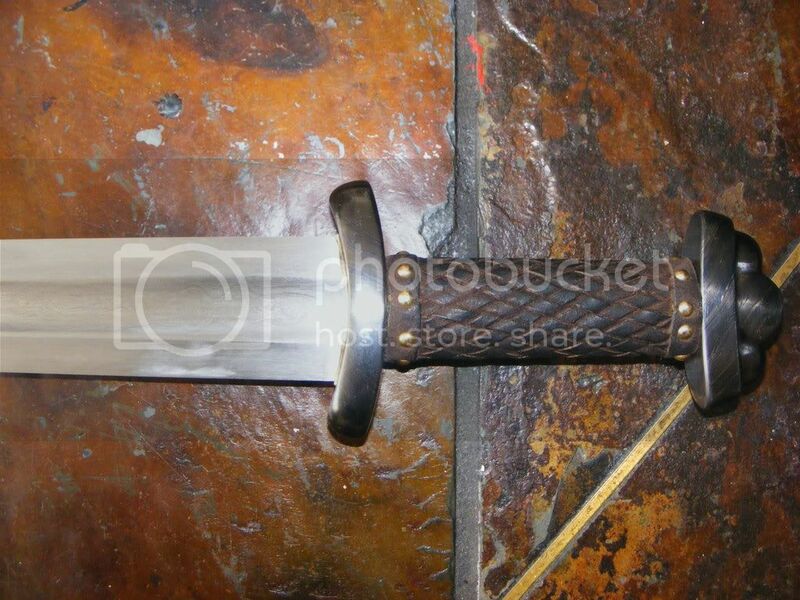 But for almost $400 I'd rather get a real sword like an ATrim or another Darkwood. Thanks for your replies, all! I actually want to use this type of grip for a set of new fire staves I'm making (I'm a fire performer - double staff). I thought it looked like it would be quite durable and grippy, but perhaps you guys are right that the strips would move around a lot. Still I'd like to think there is a way to make it work. I'm interested in this because it looks easy to replace (my grips always wear out, even high quality ones - I throw a lot) and cheap to construct. Also I think it looks good, since my props are part of the show too. I've been looking into Japanese hilt wrapping techniques, but I was hoping to do something with leather instead. I'll probably get around to attempting to duplicate this sometime, at which point I'll take some pictures and report back here. It might take me a month or two though to get around to it. Tsukamakishi (traditional Japanese hilt wrapping craftsmen) use a variety of materials and techniques, including leather. I can tell you with a fair bit of certainty that the fantasy sword posted will not be based on any traditional Japanese method, but on the other hand by researching those methods you could produce something of great aesthetic and functional value. Images of a staggering variety of traditional tsukamaki from the Japanese Sword Society of the US. Many very unusual and rare styles. wow, thanks! The diagrams on Thomas Buck's pages are especially great. It consists of 3 straps. Wrap the first strap going clockwise, giving an empty gap of 1 strap-width on each turn. Wrap the second going counter clockwise doing the same. Wrap the third going clockwise again, following the gap left by the first strap. It feels moderately secure, but difficult to tell since it's just shoelaces. I definitely think the grip would travel over time, though, especially with leather, but perhaps not with a synthetic rubber or if I applied some adhesive. I dont presume to know how its done, but the similar wrapping on my Godfred has held up perfectly through lots of use. Perhaps someone knows this method of wrapping if Eric is interested in it.